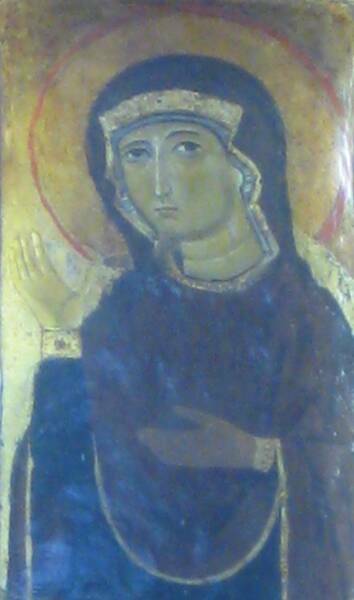 This very ancient icon of Our Lady is in Rome. "Dear children, The Holy Spirit, according to the Heavenly Father, made me the mother - the mother of Jesus - and by this alone, also your mother. That is why I am coming to hear you, that I may open my motherly arms to you; to give you my heart and to call you to remain with me, because from the top of the cross my Son entrusted you to me. Unfortunately, many of my children have not come to know the love of my Son; many of them do not want to come to know Him. Oh, my children, how much bad is done by those who must see or interpret in order to come to believe. That is why, you, my children, my apostles, in the silence of your heart, listen to the voice of my Son, so that your heart may be His home, that it may not be dark and sad, but that it may be illuminated with the light of my Son. Seek hope with faith, because faith is the life of the soul. Anew I am calling you: pray, pray to live faith in humility, in spiritual peace, and illuminated by the light. My children, do not strive to comprehend everything immediately, because I also did not comprehend everything immediately; but I loved, and I believed in the divine words which my Son spoke - He who was the first light and the beginning of redemption. Apostles of my love - you who pray, sacrifice yourselves, love and do not judge - you go and spread the truth, the words of my Son, the Gospel, because you are the living Gospel; you are the rays of the light of my Son. My Son and I will be with you to encourage you and to test you. My children, always implore the blessing of those, and only of those whose hands have been blessed by my Son, of your shepherds. Thank you. " "I always feel I have a great mother myself and a great model in Our Lady in heaven. And that's somebody I just constantly turn to. And the rosary is such an important part of my life with that - I just find that nothing ever goes unanswered with the rosay. I find such incredible consolation with that. I think it was Lucy of Fatima who said that there's no problem that can't be resolved through the rosary. No matter how small, or how difficult, how big, whatever the problem is, if I always take it to the rosary, to Our Lady, I always find great consolation, even if I don't get the answer I want, I find the most incredible consolation through Our Lady." “Queridos hijos! Hoy los invito: ¡oren por la paz! Dejen de lado el egoísmo y vivan los mensajes que les doy. Sin ellos no pueden cambiar su vida. Al vivir la oración, ustedes tendrán paz. Al vivir en paz, sentirán la necesidad de dar testimonio, porque descubrirán a Dios a quien ahora sienten distante. Por eso, hijitos, oren, oren, oren y permitan a Dios que entre en sus corazones. Regresen al ayuno y a la confesión, a fin de que puedan vencer el mal en ustedes y en torno a ustedes. Gracias por haber respondido a mi llamado."